“Growing up, I was a petite girl. Of course, as you grow older, have kids, and take on responsibilities, life starts to change. I had my first child in which I didn’t stay with too much weight after birth (167 pounds down to 135 pounds). But I was not eating healthy and I started to gain weight. I tried multiple times in joining different gyms in which I only lasted for about three months. I wasn’t focused nor committed, and also was having problems in balancing work, family, errands, and the gym. So I gave up! I had my second child five years later in which, after birth, I weighed 160 pounds and was extremely unhappy. I wasn’t happy in my skin and it worried me as this affected me mentally and physically. “The moment that changed my mindset was looking at the picture of myself in the photo on the left. 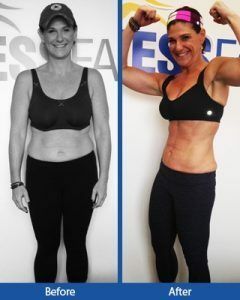 After years and numerous attempts at weight loss, the constant motion of going up and down, the emotional struggle, and never really feeling happy about myself or satisfied, I was not seeing the results I longed for and my weekly workout routine became less effective. I knew that I had to take on a different approach. I joined NJFF in June of 2017. I was nervous to start and take on something new, but from my very first day I took a class, I knew there was no looking back for me. The classes are exceptionally great, challenging, and intense. The trainers are all awesome — they are encouraging, motivating, and have their own unique workouts. The atmosphere is upbeat, energetic, and positive and I always leave wanting to come back for more. That is the feeling I lost, but I now found myself to love working out again and am back to being consistent with my weekly workout routine five times a week. 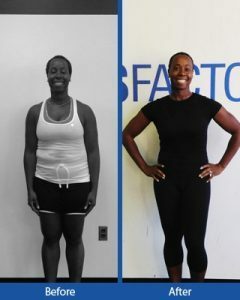 As you see my picture now on the right, that is my weight loss success I have been longing to achieve. As an added bonus, I am wearing jeans! I have not worn a pair of jeans in years. 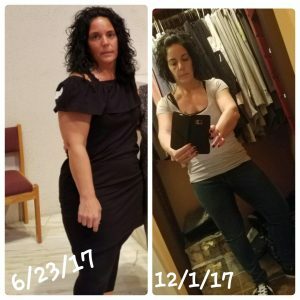 With my workout regimen at NJFF and a weight loss program, I finally found what works for me and what has given me the best results thus far. I set a goal to lose 20 pounds, which I finally reached in September. I then set another goal for another 10 pounds; I lost many inches off my waist and toned my legs and arms. I gained more strength and learned different exercises I never knew how to do. I hated and found it hard to look at myself in the mirror, while now, I can do it and actually see a difference in my body. I have never worked so hard! Although I may be slow or not as fast as others, I am doing it and I didn’t give up. I thank the trainers for pushing me and helping me succeed. I accomplished something I never thought I would be able to do and I am beyond proud of myself. It’s not easy, but I learned to start with small tasks, take each day one by one and not let the bad days I have to stray me from ruining how far I came. Also, being a part of such a beneficial exercise program helps me stay accountable for my nutrition. My next goal will be to maintain my weight and I know with the help of NJFF, I will be able to do it. “NJ Fitness Factory’s format is unique to anything I have ever done. I can’t do anything else now. It’s like personal training but in an energized group environment. You are led by an instructor who has eyes on everyone, is ensuring you are pushing yourself to the very max and doing the exercises properly. I have loved not having to think about what I need to do in order to get a complete body workout by weeks end. It’s all planned for you! It has been a winning formula for my mind and body. The energy and feeling of togetherness and teamwork have inspired me to go from working out 1-3 days per week to 5-6 days per week. I don’t dread going to the gym as I have in the past. I have been going to gyms all of my adult life. I have done personal training, traditional classes and worked out on my own. Nothing has changed my body and more importantly my attitude about working out like NJ Fitness Factory. I have lost more overall inches and added more muscle in the last year and a half , than all years combine anywhere else. The instructors are friends and leaders. They take personal pride in your success in the most genuine way I have ever experienced. Throughout my time here, trainers have changed for a variety of “life” reasons, but there was a quality shared by all, which obviously is a testament to who is hired. They have a dedication to making sure the workout is invigorating and fresh each class. They are engaged in such a way that motivates you to push yourself for them! They show a real interest in each member to ensure that everyone gets what they are coming for, no matter what level of fitness or experience. Among the members, there is a community feel; as you walk in you can see the togetherness as everyone is talking and preparing for class. The social aspect is a freshly added bonus. Having recommended to friends and made new friends here, walking in to sweat with familiar faces helps you get there and have fun doing it! The camaraderie is infectious! It makes you feel you have an obligation to get there and work hard, which I don’t care what anyone says. We all could you use that extra reason at times! 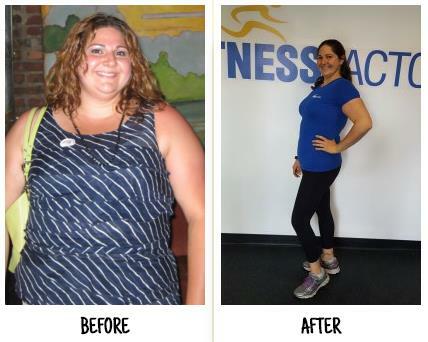 “When I stepped on the scale at the end of NJ Fitness Factory’s six-week body transformation program and saw that I’d dropped from 268 to 240 pounds, I almost fainted. Literally! It was a challenging road but a worthwhile one, and along the way, I learned some key things about both myself and health and fitness. I’ll start though with some background. I was overweight for my entire grammar and middle school days. In high school, I joined the wrestling team, and it was there that I learned the core truth about health/fitness from which everything else stems: eat right and exercise. The pounds melted off of me in high school thanks to the training, help, and encouragement of my wrestling coaches. I’ll return to this last point in a moment. Fast-forward to my life as an adult. I went into a “yo-yo” phase. A few years heavy followed by a year not, over and over again in a continuous loop. 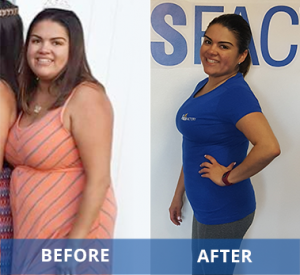 When I did lose weight, I worked hard exercising and watching what I ate but it was always so easy to fall back into old habits – whether out of stress or merely a desire to indulge in the “fun” foods. Fast-forward again to earlier this year. I turned 48 years old. Losing weight was harder than ever while gaining it was easier than ever. I went to the gym, worked out a great sweat on the machines I used, but never lost weight. Admittedly, I wasn’t paying too close attention to what I ate or drank. I did know that my aches and pains were worse than ever, as was my indigestion and my inability to walk up and down stairs without huffing and puffing. I inherited a bad back, bad knees and ankles from my wrestling days, and according to my doctor, I also got to develop arthritis at an earlier age from wrestling, too. Additionally, within the last few years, I was diagnosed with Reactive Hypoglycemia, a metabolism imbalance which compromised my energy levels and required special dietary care. If not monitored, it could lead to diabetes. These factors were in no way helped by my extra weight. I knew something had to be done. 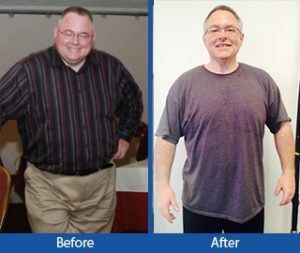 One day I noticed an amazing before-and-after transformation photo posted on Facebook by my friend Frank DiCicco. I started quizzing Frank on the program and, to my surprise, all of his answers indicated to me that this was simply, “eat right and exercise.” No special pre-made meals or supplements/shakes, but a balanced diet that was low on carbs and sugars, high on proteins and good fats and of course, vegetables and fruits. The exercise was another matter. It is hard, no question about it. Having gone through wrestling, I knew what tough workouts were like, and I was able to flash back to my high school days to mentally find ways to push through each tough workout. I made a promise to myself that I would mentally try the best I can and make it through each workout, even if I couldn’t do each exercise perfectly. I would substitute and modify where necessary and do whatever I could to keep moving. That is how I approached each day, with a “try-my-best” attitude. It took me very far. One key thing I learned at NJ Fitness Factory was the reason behind my own recent (pre-six week challenge) exercise regimen failing. I was not exercising my core. I was doing exercises and using machines that just worked out one body part at a time. At NJ Fitness Factory, the exercises are designed to engage your entire core – multiple body parts at once – and, let me tell you, I recognized the difference right away, not just in the fact that I could feel every part of my body getting worked out but also through the amount of sweat I perspired as I exercised! Earlier I mentioned my wrestling coaches from high school. That is a major factor at NJ Fitness Factory. The main group training instructors I had were great motivators! They gave tough workouts but also a lot of positive reinforcement, encouragement, and instruction, like my wrestling coaches. And then there is the accountability factor – the program encourages keeping a log and has periodic meetings to go over progress. While I didn’t keep a formal log, I was fully immersed in a mindset of staying on track with what I was eating. 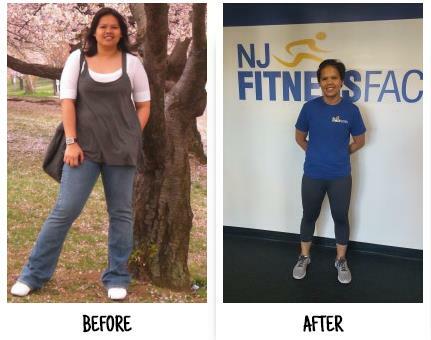 There are those who can tackle health and weight loss on their own with no problem, but what I learned about myself is that I need the coaching and accountability aspects that the structure of NJ Fitness Factory’s program provides.